In the thirteenth century, an age half crazed in its quest for certainty, King Henry seeks solace in the building of cathedrals. But Christians do not make good architects. To create the illusion of permanence - those soaring wonders in stone - Henry knows to rely on the masons, the secret brotherhood whose very craft disguises a dangerous heresy and creates a blasphemous beauty. 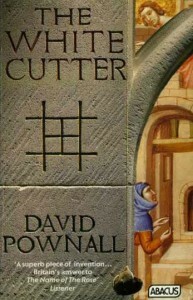 The white cutter is the confession of Hedric, son of an itinerant stonemason, reared in a tool-bag, who becomes the greatest architect of his age. It tells of rumbustious adventures; of his sexual apprenticeship; of his unique education; of rouge clerics, singular nuns and The Four, a secret cabal teetering on the brink of genius and dementia. It is a book which reveals much more about light and stone, God and the Devil, Fathers and sons, the Church and the State, love and murder, our need for secrecy and our need for uncontradicted truth in an age of chaos. A cracking good tale. Pownall has touched before on the dark and arcane but never to such effect. He was always a good novelist, now he is a major one. Independent. A bold and intelligent slab of historical recreation. The Times.